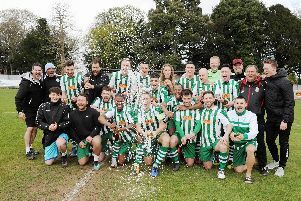 An emphatic 4-0 mid-week victory at East Preston sent Chichester City to the top of the SCFL premier division. George Way gave the visitors an early lead and second half goals from Scott Jones, Kieran Hartley and Connor Cody ensured Miles Rutherford’s side continued their unbeaten start to the season as a mean defence kept a fourth clean sheet in five league games. The City boss made changes to the starting eleven that beat Broadbridge Heath in the Peter Bentley Cup at the weekend. In came Ben Pashley, Terrell Lewis, Jones and Cody. The visitors broke themselves thanks to a super pass from Jones. Herbert picked out Way, who struck the ball sweetly into the top left hand corner. No dubious goals panel needed here. EP threatened seven minutes later following an overlap by Luke Brodie. Jones, with three goals in four league games, missed a golden opportunity in the 26th minute from close range after a precision pass from Matt Axell to Hartley. Hartley then blazed over when a square ball might have been the better option. A mazy run from Lewis down the right opened things up and resulted in a free-kick. Martin’s set-piece made Ben Purkis work and the keeper palmed the ball away for a corner. Martin whipped this in towards Hartley at the far post. Again Purkis did well in gathering the ball under pressure. There were chances at the other end. First, Cian Tilley dragged an effort wide on 34 minutes before Heryet could have, should have done better in the box after Cody slipped. Then a stretching Matthews just managed to get something to a drive with a minute to go to the interval. In time added on Way teed up Jones only for his fierce shot to brush the frame of the goal. East Preston had a couple of chances just after the break but Jones doubled the lead on 54 minutes bringing the ball down with a lovely touch before beating Purkis to his left. Two minutes later the EP keeper just managed to get to the ball before Way, after good work from a marauding Cody. Three chances came and went in quick succession for the home side. Scott Rafferty was unlucky with the first of these before Heryet had a go from distance. And then Matt Searle got on the end of a free-kick without really troubling Matthews. A curling effort from Hartley made it 3-0 in the 63rd minute, although Jones might have a case for getting the faintest of final touches. A super nutmeg from Lewis fed Jones who laid the ball off to Dave Herbert but Herbert’s cross was too deep for Way. Rob Hutchings came on for Steve Herbert and Lorenzo Dolcetti for Axell as the visitors drew on the resources of a strong bench. City had to play the last ten minutes with ten men though after Jones was shown a red card following a discussion between the referee and his assistant. Rutherford made another change bringing on Tiago Andrade for Way and the striker could have got on the scoresheet but headed wide a cross from Lewis and then had a drive parried by Purkis. Cody scored Chi’s fourth in stoppage time with a nicely directed header.